The Bayard Cutting Arboretum farm was established in 2012 on a parcel of land which overlooks the Connetquot River and is adjacent to a historic barn that was used by the Cutting family for their herd of Jersey milking cows. Later, the meadow was mowed and the barn used for storage until the Arboretum’s Director Nelson Sterner decided to devote a portion of the land for growing crops. The land was turned over and prepared for planting in the early spring of 2012. The main room of the barn was cleaned and painted and is now used as the information center and pick up area of the CSA. Almost 13 tillable acres are devoted to the CSA, however, only two and one-half acres are under cultivation. Currently, we have three main fields, an herb bed, cut flower bed, and an asparagus patch. Each year we test the soil and add compost and minerals. Our goal is to create a soil that is biologically rich and balanced so that we can grow food that tastes good and is good for us. David Noriega started Gardening 6 years ago in his parent’s backyard turning it into a Permaculture oasis growing hundreds of pounds of food with just a shovel and a true love for nature. This interest was sparked during a time where he really started to care about his overall health and wanted to know exactly where his food was coming from. Four years of expanding his parent’s backyard into a huge garden and a 3-month trip to South America he felt it was time to start doing what he loved full time. Upon his return from South America, he applied to the H.O.G. Farm which is an 18-acre farm offering a CSA and supplying local restaurants with fresh produce. During his second season at the H.O.G., he was blessed with a newborn baby girl! With a lot of excitement within his heart, he felt it was time to move on and manage a farm which landed him here at the Bayard Cutting Arboretum. David is dedicated to living a life that works with Mother Nature not against her by practicing sustainable and organic methods of farming. On top of farming and being a Father, he also is a musician, studies herbalism, photographs birds and runs yoga retreats with his Partner. Farm Director Jen Campbell is pleased to return to Bayard Cutting Arboretum CSA Farm in 2017. Jen came to Bayard with nine years experience creating and managing a small 50 member CSA on the south shore of Long Island. She was responsible for producing high-quality organically grown vegetables, herbs, and flowers for weekly distribution to its members. 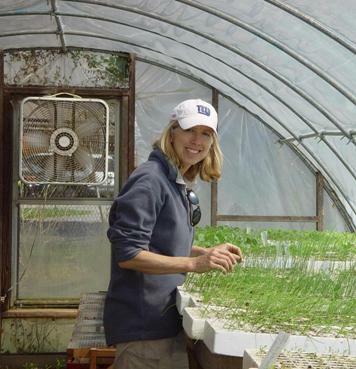 She planned and maintained the field, managed the greenhouse, and coordinated and trained the member volunteers. She helped to develop and implement an ecology curriculum to teach middle school students and she educated local garden clubs and community groups through site visits and lectures. She was awarded a certificate of Master Gardener in 1993 and was named Master Gardener of the Year in 2007. She was the owner of a small garden design and planting business and gained further experience working at a local nursery. Prior to creating a CSA, she developed strong organizational and interpersonal skills working in the public affairs office of a university. 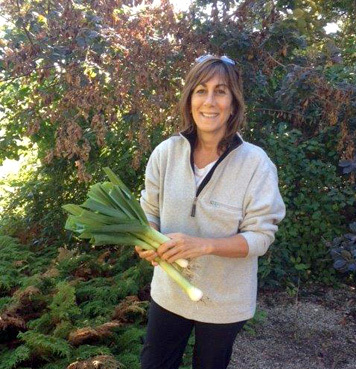 In her fifth year, Jen plans to combine her passion and knowledge of organic gardening with her organizational skills to improve the CSA and to maintain the goals of producing high quality produce, developing a dynamic farm community, educating the public and creating a farm that is beautifully maintained and welcoming and accessible to its members and the public. Johnny started his journey at the Arboretum in 2015 as a farm intern and continued in 2016 as a farm apprentice. 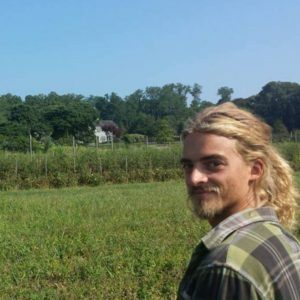 As a trained Permaculture landscape designer, he brings an additional perspective to further the farm’s goal of regenerative organic farming. He is dedicated to supporting the CSA community’s access to the freshest, best quality produce available as well as the deep connection that forms in relationships shaped around this practice. He enjoys engaging the often curious public on the practical and philosophical operations of the farm. Facilitating and aiding in people’s experience of symbiosis with their local landscape is a driving passion for him. His initiation into the world of gardening came from both his maternal and paternal grandmothers. When he was a young boy he spent much of his time in his maternal grandmother’s traditional German-style garden and his paternal grandmother’s traditional Greek-style garden, both embedded with the philosophy of growing as much food as possible while maintaining balance in the ecosystem. He has a strong personal interest in sharing the healing practices of herbalism, yoga, and qi-gong empowering people to further their own health sovereignty. During her tenure as a middle school science and elementary enrichment teacher, Karen developed a farm curriculum based on the well-known program “Edible Schoolyard” founded by Chef Alice Waters of Berkley, California. For years this program focused on teaching students the importance of being conscientious stewards of the land, growing their own food, developing better eating habits, and incorporating this information into their daily lives. Now retired from formal teaching, Karen has brought a similar program to the Bayard Cutting Arboretum and its newly founded CSA. Children’s workshops are offered on Wednesday afternoons throughout the growing season at the CSA. In addition, Karen has developed a School Field Trip Program which is now available for local school children in Grades K-5. The basic belief of these projects is that the key to a future healthy society is to educate our children and to empower them by taking control of their eating habits. Learning to grow their own food allows the children to get their hands dirty while digging in the soil, planting, and exploring the wonders of nature. It is an opportunity for children to learn life lessons outside the classroom.